"One interpretation of the work is that it depicts the rampant prostitution that occurred in the Bois de Boulogne, a large park at the western outskirts of Paris, at the time. This prostitution was common knowledge in Paris, but was considered a taboo subject unsuitable for a painting. Indeed, the Bois de Boulogne is to this day known as a pick-up place for prostitutes and illicit sexual activity after dark, just as it had been in the 19th century." 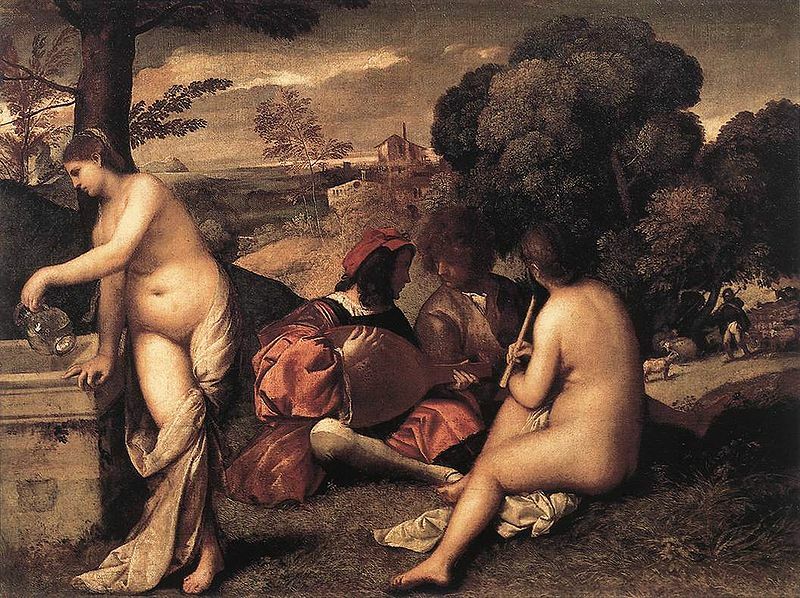 The Pastoral Concert, above, was painted in 1508 by Giorgione or possibly Titian. In the view of art experts, it closely resembles Le déjeuner sur l'herbe, featuring two dressed men seated in a rural setting, with two undressed women, and could well have been an inspiration for Le déjeuner. It is in the collection of the Louvre in Paris making it likely to have been studied by Manet. For our purposes, the small musical instrument (a piccollo perhaps) could certainly be used to administer short stinging strokes, but might be vulnerable to breakage. Look again however at the large stringed instrument. No sign of any strings however, much busy fingerplay notwithstanding. What we have here, modestly disguised from prudish eyes, is a very early, and large, 16th century paddle. This was long before the appearance of such tools in the hands of American disciplinarians, the country more often associated with paddling. And Lo!, what a paddle it is! Even applied to the ample cheeks of the owner's lady friends, the piccollo will be a mere minuet, a practice piece, a child's toy of a performance by comparison. You're right of course. Art galleries will be a different experience after this! Or are you subtly setting the scene for a new sort of picnics next summer?